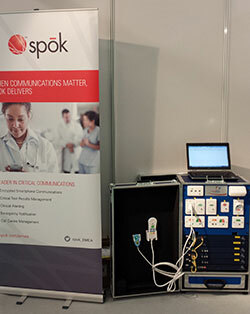 NiQ Health was fortunate to join their partner Spōk at the Healthcare Efficiency through Technology (HETT) Expo at Olympia London. NiQ Health CEO (Europe) Mr Christian Testorf attended the event, showcasing the CarePlus™ solution to many prominent UK healthcare professionals. This event was attended by over 3,200 visitors, the busiest and largest HETT event to date. The HETT Expo is designed to help health professionals understand what technology is available and how it can be used to transform services and improve patient outcomes. HETT 2014 featured critical updates from leading healthcare and central government organisations, practical guidance on the latest technology available, and showcased innovative solutions to improve efficiency. NiQ Health appreciates all those NHS Trust Managers who requested meetings and is looking forward to attending the next HETT Expo in 2015.